For a well-known brand to establish a legitimately funny social media presence, it needs to navigate the edges of irreverence without getting too snarky or caustic. It's something very few have been able to do successfully and a strategy that can quickly backfire. 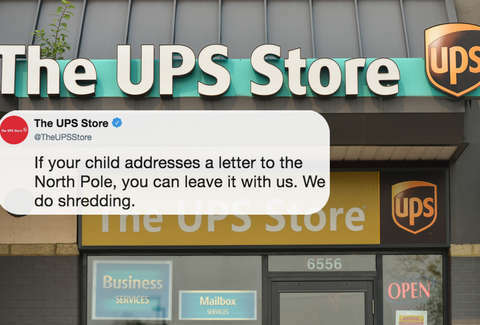 The UPS Store may have learned that the hard way on Monday after it decided to delete a viral tweet about... shredding children's letters to Santa. 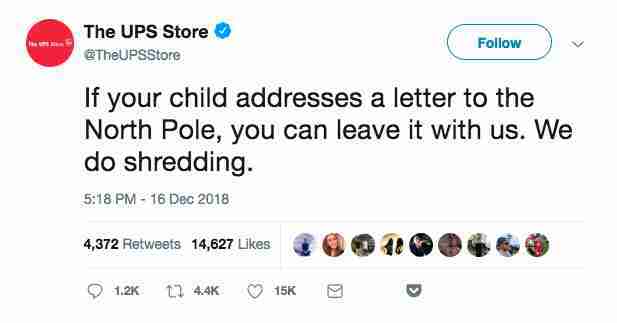 On Sunday evening, The UPS Store posted a tweet that was presumably meant to be playful and funny, suggesting that parents could drop off letters their kids wrote to Santa there, because they offer shredding services. "If your child addresses a letter to the North Pole, you can leave it with us. We do shredding," the tweet read. Well, people quickly took notice, and the dark office supply store joke went viral, racking up nearly 15,000 likes and 4,300 retweets in less than 24 hours. However, reactions were mixed, to say the least, and it appears to have left a bad taste in the mouths of more than a few people who were unimpressed with the brand's Grinch-y disposition, however tongue-in-cheek it was meant to be. While there were plenty of people who seemed to enjoy the tweet, the backlash was too greate for some and by a little after 2:30pm on Monday, it was deleted. Fortunately, the responses are still around, so you can get a taste of how it sat with some people. Whoever runs (or was running) the account also appeared to be a bit overwhelmed or confused by the deluge of responses, and engaged with at least one user reacting to the tweet by attempting to address presumably nonexistent issues they were having with UPS deliveries. When reached by phone on Monday, a UPS spokesperson confirmed the company deleted the tweet after receiving negative feedback from customers, saying, “We in no way wanted to be a grinch, and we in no way wanted to take away from Christmas and the holidays.” Instead, the tweet was meant to be a fun way to feature The UPS Store’s not particularly fun services, like printing and shredding, the spokesperson explained. And, honestly, can we blame them for spicing things up a bit?